When Salman Rushdie mocked Islamic sanctities in 1989 in his magical realist novel The Satanic Verses, Ayatollah Khomeini did something shockingly original: He pronounced a death edict on Rushdie and all those connected to the production of his book. By doing this, Khomeini sought to impose Islamic mores and laws on the West; we don't insult the prophet, he effectively said, and neither can you. Khomeini's edict also had the unexpected side effect of empowering individuals – Western and Islamist alike – to drive their countries' policies. In brief, any Westerner can buy a Koran for a dollar and burn it, while any Muslim with a platform can transform that act into a fighting offense. As passions rise on both sides of the democratized Western / Muslim divide, Western provocateurs and Islamist hotheads have found each other and confrontations occur with increasing frequency..
Kurt Westergaard's 2005 image of Muhammad with a bomb in his turban. 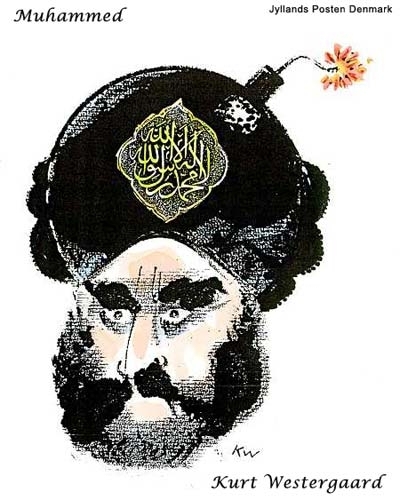 Which prompts this question: What would happen if publishers and managers of major media reached a consensus, "Enough of this intimidation, we will publish the most famous Danish Muhammad cartoon every day until the Islamists tire out and no longer riot"? What would happen if instances of Koran burning happened recurrently? Sep. 24, 2012 updates: (1) I respond to an Islamist criticism of this piece, again at FoxNews.com, in "Mocking Muhammad Is Not Hate Speech." 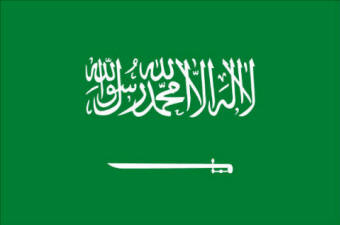 (2) A reader points out the striking resemblance between the Westergaard cartoon above and the Saudi flag below. Both contain two elements: the shahada ("There is no deity but God and Muhammad is His prophet") and a weapon (bomb, sword). It's just the imaginary face of Muhammad that distinguishes them. Sep. 25, 2012 update: The Los Angeles Times tells about two ex-Muslims, Mosab Hassan Yousef and Ali Sina, who have plans to make big-budget derogatory films showing Muhammad on screen To which I can add a third ex-Muslim with the same intent, Imran Firasat. 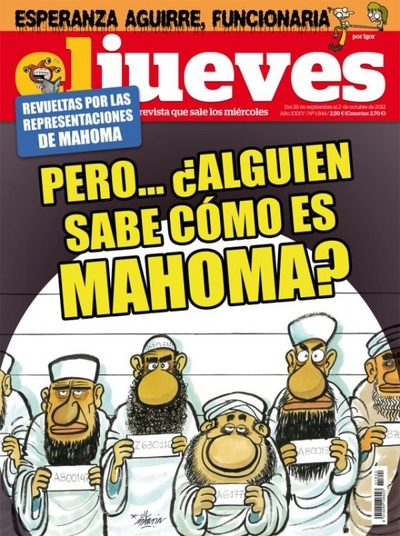 Sep. 26, 2012 update: The cover of Spain's El Jueves magazine asks "Does anyone know how Muhammad looks?" Oct. 4, 2012 update: The cover of the German satiric weekly Titanic shows the wife of the former German president with a Muslim warrior and claims, facetiously, that she is making a film about Muhammad. Related Topics: Freethinking & Muslim apostasy, Radical Islam | Daniel Pipes receive the latest by email: subscribe to the free mef mailing list This text may be reposted or forwarded so long as it is presented as an integral whole with complete and accurate information provided about its author, date, place of publication, and original URL.